This, you imagine, this is the year. The year you stroll into the dealership, still full of Thanksgiving turkey, and nail down the deal of a lifetime on a new or pre-owned car. Sadly, it’s not that simple. If you’re going to fight the horde on the busiest shopping day of the season, here some rules to follow. Millions of Americans are convinced that buying a car on Black Friday is like showing up early to Best Buy and getting an LCD TV at 70 percent off. That’s not really how it works. The actual process of buying a car on Black Friday is no different, or no better than, buying a car any other time of the year. Don’t be fooled by the marketing blitz or the websites that claim there are “33 percent more deals” on Black Friday. An advertised “deal” doesn’t necessarily translate into savings. 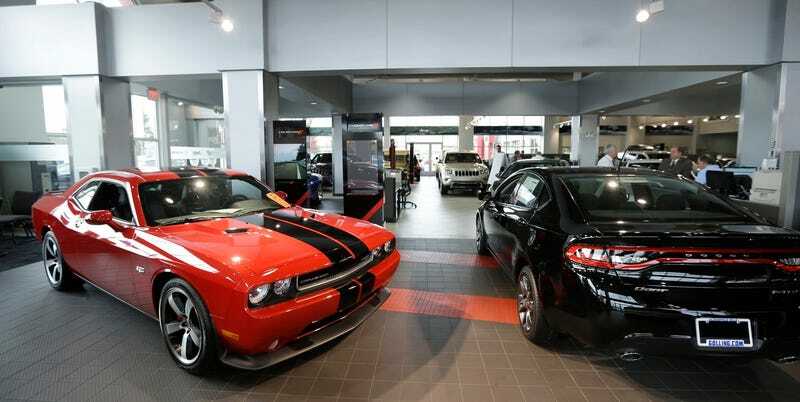 Just like any other kind of retailer, car dealerships are going to be packed on Black Friday. This means a marathon of chaos and frustration. The dealers know the volume will be higher and some of them contract outside sales people whose primary purpose is to maximize profit for the dealer. That means these folks are especially skilled and taking more of your money than necessary. Even though the dealership may have extra salespeople on the floor, the management and finance staff will usually stay the same. This means longer wait times for the “I gotta talk to my manager about the price” thing, and even longer to find out about your financing approval. While some of your better dealers want you in and out quickly with a smile on your face and a fair deal for your wallet, other stores take advantage of the waiting with the hope that you get worn down and just take whatever deal they offer you. So what you do to take advantage of Black Friday is get started sooner. Like now. Your best bet is to avoid negotiating at the dealership. Let’s say you waited until the week of Thanksgiving to decide to buy a car: don’t worry, you can still keep the ball in your court. Take a break from prepping your pies and sweet potatoes and make some calls or send some emails. Request a quote on your desired vehicle and demand the dealer put everything in writing. If they won’t (and some will refuse), just move on to the next store. Compare the quotes, focus on the out-the-door numbers. Often dealers will open with a great discount only to make up for it with inflated back-end fees and overpriced accessory packages. Leases are a little more complicated than a standard purchase, which is why it is even more important to set your parameters and shop this deal from the comfort of your computer. If you haven’t thought much about which car you are going to buy or lease, do yourself a favor and do the research—even if that means taking some more time to buy. You aren’t going to miss out on any deals. Chances are whatever awesome price your neighbor got on Black Friday, you can come pretty close in December with the end of year deals. Buying a car is the second most expensive purchase most people will make aside from their home. Unlike the newest electronic gadget or a two-for-one sweater sale, a car is not something you buy on a whim. Remember: just because a car is “cheap” doesn’t mean it’s a good deal. While there are very few objectively terrible new cars on the market these days, there are some models that are just not competitive with their peers. Don’t be fooled by cars that have crazy discounts off the MSRP; that often means the brand couldn’t sell them any other way. There may be some excellent values out there, but you have to do your homework to see what cars are worth buying and which ones aren’t. The internet makes car buying easier than it’s ever been. There aren’t too many things you can’t find out with a little bit of work, such as the approximate value of your trade, available factory incentives and discounts, dealer invoice cost, and what most people are paying for a specific car in your area. Do your homework. Now before you get all fired up about your newfound expertise, remember, it’s not a deal if you can’t afford it. A lot of car buyers end up with bad deals, not because the dealer was slimy, but because the owner ended up with a car and a payment not appropriate for their budget. Don’t get caught up in the monthly payment game—you are responsible for your own finances. A free auto loan calculator app is just a few clicks away, know what you can afford so you can spend wisely. And you already got pre-approved for a loan, right? Because you don’t want to spend the day after Thanksgiving at the mercy of whatever interest rate the dealer offers you. Pre-approvals give you the power to be a cash buyer and leverage against the dealer to get you the best possible APR. So let’s say you’ve picked the right car for your budget and you have your loan ready. If you don’t want the dealer playing games with you, make your intentions clear. Tell them what you want to buy and tell them what you expect to spend. Let them know that you are happy to help them make a deal provided that they help you get the car you want for the price came for. A good salesperson is happy to have a customer that knows their stuff and has a reasonable offer on the table. Now that you are ready to close the deal, get ready for the hard sell from the finance office on extras like extended warranties and service plans. If you have done your research properly, you should know which models are worth getting additional protection for. Aside from the working the deal, there are some other tips to remember if you decide to go to the dealership. Try to get there early and beat the crowds. Bring food and water and leave the kids with a babysitter. This is going to be crazier than normal, and car buying on a good day is often a stressful experience. You need to be comfortable and focused to make sure you are processing all the information and in order to make the right decision. The key thing to keep in mind is that dealerships run sales for the entire month, not just one weekend, and most of the winter discounts on leftover models will carry over into December. Don’t follow the herd. Shop smart for your next car just like you would any other time of the year.